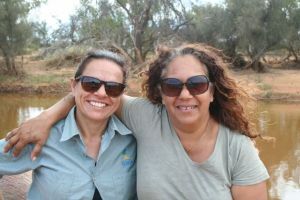 Return to Country trip: NACC Aboriginal Liaison Coordinator and Amangu/Wajarri woman Donna Ronan. In further commitment to advancing Aboriginal participation in natural resource management, NACC has recently joined the official national Reconciliation journey, by launching its own Reconciliation Action Plan, ‘Reflect’. The ‘Reflect’ Reconciliation Action Plan (RAP) assists organisations like NACC to develop relationships with the Aboriginal community and build foundations for cultural learning and Aboriginal and Torres Strait Islander employment. NACC Aboriginal Program Coordinator Bianca McNeair said the new RAP “provided practical and concrete actions for NACC to implement in recognition of Aboriginal people’s heritage as the first natural resource managers of the land that we live and work on today. “NACC supports our local Aboriginal community to care for country, to ensure it can be enjoyed by everybody, especially our future generations,” she said. All staff participated in a Cultural Awareness Professional development course. Heritage planning for four culturally significant sites, including the Warlgu Trail (interpretive signage and trail development). Implementation of the Capacity Building for Indigenous Prison Inmates project (involving on-ground conservation work and Certificate II and III in Conservation and Land Management with Central Regional TAFE). Registering of 62 Yamaji sites of cultural significance with the Department of Aboriginal Affairs under the Heritage Act. Registering of 20 Noongar sites with the Department of Aboriginal Affairs under the Heritage Act. Conducting a Marlaguwinmanha Bush Camp (return to country) and NAIDOC Bush Medicine workshop. Monthly publication of Yamaji Yarns to increase knowledge about Aboriginal cultural heritage among NACC staff. Regular and ongoing engagement with members of the Aboriginal community and engagement in NACC conservation program activities. Participation in Reconciliation Week and NAIDOC Week activities. NACC would like to acknowledge the Noongar and Yamaji people who are the Traditional Owners and original natural resource managers of the land and sea in the Northern Agricultural Region. NACC also pays respect to the Noongar and Yamaji Elders past, present and future and acknowledge the unique natural resource management skills that Aboriginal people have in supporting our region’s natural assets.